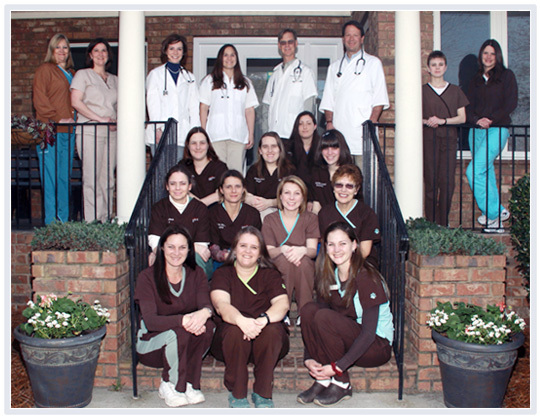 Founded in 1983 by Dr. William West, Lakeside Animal Hospital combines the open and friendly attitude of small-town South Carolina with the expertise and tools of a modern veterinary hospital. Moncks Corner and this rare slice of South Carolina is our home and we truly believe it is an honor to serve our friends, family and community. We are proud of the fact that our skills, experience and extensive knowledge of veterinary medicine allow us to provide our community the very best and most affordable care. We understand that your pet is a special member of your family and that his or her health is very important to you. We are pet owners ourselves and know that the key to good health throughout the life of your pet is preventative care. This is why thorough wellness checkups are a standard piece of the pet care we offer. We also believe that judicious application of vaccines is an important aspect of keeping your pet healthy and have developed a protocol to protect your pet from the diseases most common in our region. We also recommend and provide regular dental care for your pet because numerous diseases can originate or be exacerbated by poor dental hygiene. When you come in for an appointment you will also receive important home healthcare advice as well as new information and recommendations for the care of your particular type and breed of pet. Our clients will also see how our state-of-the-art lab and pharmacy complement our wellness care services and are a convenient and cost-effective service for you and your pet. We also realize that even the healthiest of pets experience illness or perhaps an injury at some point. Onsite diagnostic imaging tools, such as ultrasound and digital X-rays, help us quickly see into the body in order to make faster diagnosis with less testing and stress on the patient and expense to the owner. If surgery is necessary, Lakeside Animal Hospital carries a complete surgical suite in order to provide the highest quality of care with the most compassionate approach. We also tailor anesthesia and pain management to each pet, thereby reducing the amount required to alleviate pain and safely anesthetize your pet. Additionally, our expertise and ability to manage complex medical and surgical cases reduces the frequency of referrals to specialists. This allows our clients to receive care for their pets from the people they have come to know, at a familiar and convenient location, and at a cost far lower than specialty hospitals. In all, we are committed to providing our community with affordable and comprehensive veterinary services in an environment that is friendly and welcoming to both you and your pet. Look around our website and come in for a visit so we can show you what we mean by our motto: Carrying your pet for life.